Hello everyone! I've got some new yarn....actually some *fairly* newly released yarn to play with! More colour changing yarn 💕 Wanderlust was released a few weeks ago. 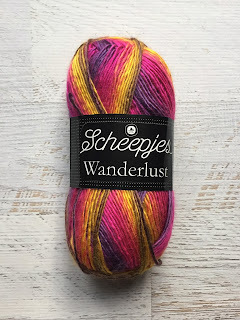 Another winner from Scheepjes. I seriously don't know how they keep releasing all this beautiful yarniness! It's a single ply yarn that is 100% Acrylic and is sold in 100g balls and that gives you 232 metres of beautiful colour changing loveliness! Don't you just love that promo pic???!!!!!! And check out that colour choice! 19 colour combinations! Can't wait to see what you make with this yarn. It's so lovely! Looks beautiful! Can't wait to see what you do with it.